It’s not really obvious, but the message is becoming more and more subtle. There are a number of Christian writers who believe they love The Church more than people who disagree with them. Who are their dissenters? They are the eggheads, the geeks, people so busy having their face planted in a 600 page book, they probably aren’t going to be able to hold a conversation with your everyday layperson. Academic language is too complicated. Theology is too difficult for THEM to understand. Philosophy? Critical Theory? Ain’t nobody got time for that! In a speech given in Washington, D.C., Cornel West discussed the idea of “the organic intellectual,” or a public figure who linked the life of the mind to social change, with his example being Rev. Dr. Martin Luther King, Jr. I believe this approach to knowledge is really quite different from the progressive anti-intellectualism that I see online and irl. Ideas are things to be consumed, become transformed into trends, sold on t-shirts, parodied on YouTube, and most importantly, ideas are things to be mentioned in books as authors sell them. Knowledge becomes power in so far as it is power over others. In stark contrast, the organic intellectual is committed to wisdom, putting ideas into practice, and reflecting on that praxis time, and again. Wisdom is also an intelligence that is shared, never to be privatized by a small class of wannabe celebrities. One probable case contrary to progressive anti-intellectualism took place during the time after I had finished my Masters thesis. No one in my family or circle of friends really bothered to ask me what my research was about. Months later after everything was said and done, and I had started attending worship at a local congregation after a year or so of working on staff at another church, I became re-acquainted with a few of the elderly members of the church. Every Sunday, I would make sure to say hi and have small chat with Ms. Polly, and the more we talked, the more I learned we had in common. It turns out, she had experience in theological education, and so did some of her children as well. When I told her what my degree was in, and that I had to do a thesis, Ms. Polly asked me what was my thesis on, and I explained my topic to her. It was the first time outside an academic setting that someone had cared to ask me about my research interests. It’s something that I’ll never forget, and I haven’t forgotten. Later on that year when members of the church were called upon to volunteer to repave Ms. Polly’s driveway, I was one of the first people to sign up. All because we had bonded over theological discussions. At church. The real question should be: do these Christian writers who “love” the Church more than the “intellectuals” really love the Church? If you love someone, would not you want to share with them the best wisdom that others have to offer? If you love average person in the pew, then why would you presume that they wouldn’t be interested in the life of the mind? This entry was posted in Political Jesus and tagged "THE CHURCH", anti-intellectuals, blogging bishophoric, Cornel West, progressives, scholarship on November 4, 2014 by Rod T.
First of all, as I pointed out, and continue to do so, racism operates as a system, a set of practices. Whether the Paula Deens and Louis Farakkhans of this world are privately racist, I do not give a kkkrap. Racism is prejudice (the devotion to racist, appalling stereotypes like blacks as natural violent criminals because of their skin color) PLUS power (the ability to apply discrimination, to impact the lives of those not in power). Bringing up racism is not racist #sorrynotsorry Fox News. It’s an idiotic, anti-intellectual line of argument where conservative and liberal whites want to throw around their authority to dismiss and ignore the experiences of people of color. Appeals to color-blindness are just that: attempts to silence people of color who have legitimate concerns about the distribution of justice in society. An example of white supremacist anti-intellectualism is the conservative tea-bagging reaction to the work of Derrick Bell. Not only did they work to misquote Bell, and to mount personal attacks on him, they also made some of the dumbest comments about Critical Race Theory, a topic talking heads from the right wing media pretty much don’t understand. For some white supremacists, critical race theory is nothing more than complaining POC scholars who have nothing but “anti-white resentment.” It’s gonna get quite confusing for these idjits when they start reading critical race theory by white persons or whiteness studies. Adding this “criticism” plus the larger taboo of dialoguing with Marxism as a big no-no, white supremacists show their true colors because they do not want their racist assumptions to be confronted. So what does white supremacy do when racist theories and whitewashed histories get dismantled? REVERSE RACISTS! ANTIRACISTS ARE THE REAL RACISTS! It’s both pathetic but somehow effective way to convince the Idiocracy of the rightness of white supremacy. It’s so sad this method continues to work. Like the racist myth of black criminality, the white supremacist argument that “the antiracists are the real racists” is an argument built upon racist myths (the angry minority, the “objective” white subject) that is meant to silence any criticism of white supremacy. No, the real racists are the defenders of racist institutions and practices. The real racists are those who continue to whitewash history and cultural media in the name of the “free market.” The real racists are the ones who are the most likely to ignore statistics and facts in the name of the their ideology and “patriotism.” And this is part of the reason why anti-racism movements and theories will continue to be unpopular in the US of A. This entry was posted in Political Jesus and tagged anti-intellectuals, critical race theory, ethnicity, racism, white supremacy, whiteness on July 22, 2013 by Rod T.
Young Earth Creationist Ray Comfort: Bibliophiles Worse Than Pedophiles! No, I’m not making this up. For anyone who has been persuaded by the arguments of this guy, you may want to reconsider. WAIT WAIT WAIT WAIT WAIT!!! Did anyone see the other problem with this picture? 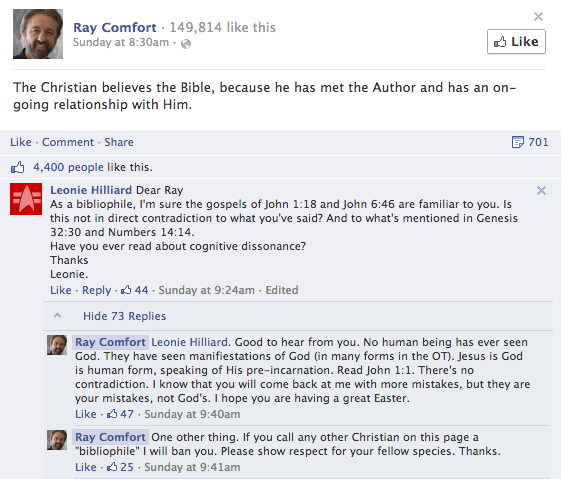 THERE WERE TWENTY-FIVE LIKES for the second part of RAY COMFORT’S response. REALLY? REALLY? Fools just attract more foolishness. And the funny part is that Mr. Hilliard is right! No one has met God, so no one can claim to be inerrant in interpretting the Bible, no not even you, Mr. Comfort. Whoops! We would never want to call Ray Comfort a lover of books, especially since he makes such terrible arguments for his preferred interpretation of Genesis. Glad he could apologize, but still, not even a google search to look up what a bibliophile was? Really? Really, man? Thanks to Grace Is Human for the Heads up and Hemant Mehta for the link. This entry was posted in Political Jesus and tagged anti-intellectuals, Sunday funnies, Young Earth creationism on April 7, 2013 by Rod T.